this stonking set collects their first 8 studio albums, plus a mammoth amount of bonus rarities, celebrating their achievements on stage, in the studio & in the public eye. Including 8 vinyl LPs reproduced in their original sleeves, remastered by renowned mastering engineer Andy Pearce from the original tape & pressed on 180 gram splatter-coloured vinyl, It also include two 7’’ singles, all reproduced in their original sleeves. A crucifix-shaped USB stick is included which can be worn around the neck & contains MQA high definition audio of the first 8 Albums. 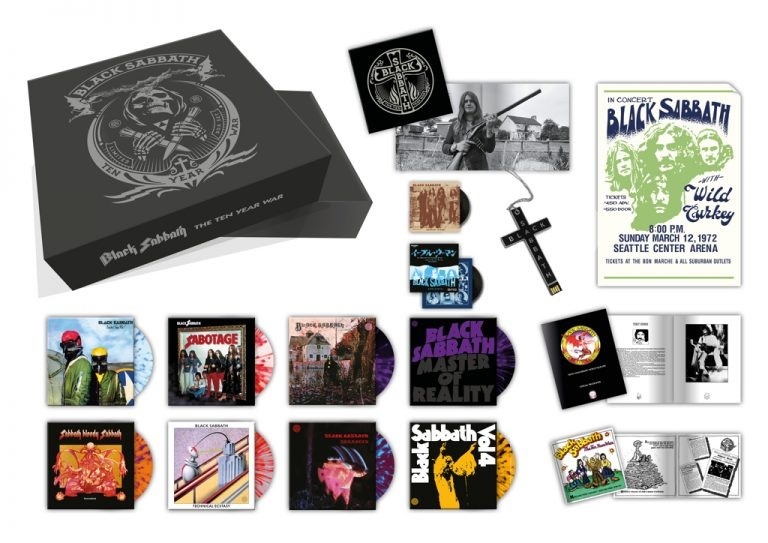 the set also includes The Ten Year War brochure, reproduced from the original publication, a hardback book featuring accolades from the cream of rock royalty, coupled with photography of the band during their 1970s tours, recording sessions & photoshoots, as well as the reproduced Tenth Anniversary World Tour 1978 Official Programme & the tour poster from the 1972 Seattle Centre Arena show.